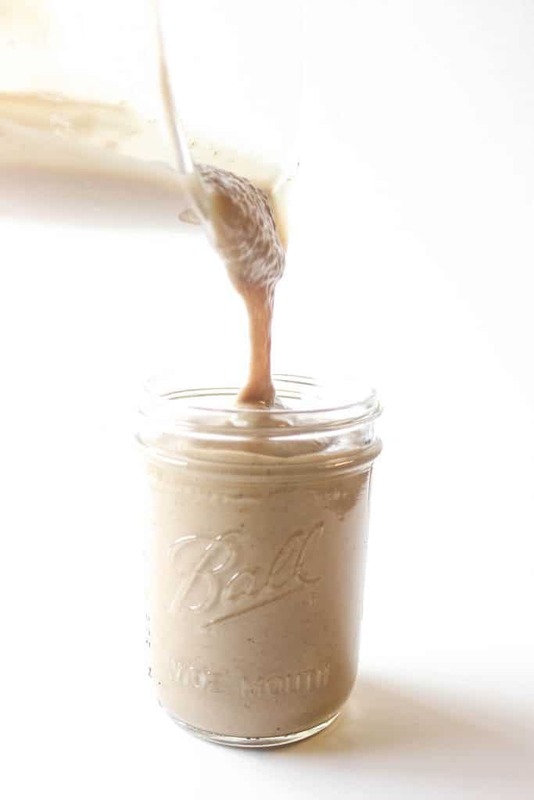 Made with almond milk, powdered peanut butter, frozen banana for thickness and creaminess, and chocolate protein powder, this chocolate peanut butter smoothie seriously tastes like a frozen peanut butter cup milkshake. The more banana, the better because it makes the smoothie so thick and delicious. I’ve always loved the chocolate + peanut butter combo. At the end of every night of trick-or-treating growing up, I’d trade my Snickers, Kit Kats, Milky Ways, Crunch Bars, and Baby Ruths for as many Reese’s cups as I could get my hands on. Not to mention Whoppers and Raisinets– those were the first to go. 10 Whoppers for 1 Reese’s cup? Deal! These days, though, nothing beats a dark chocolate peanut butter cup. And not surprisingly, most of my favorite ice cream flavors include chocolate and peanut butter, like classic moose tracks or Ben & Jerry’s Tonight Dough. 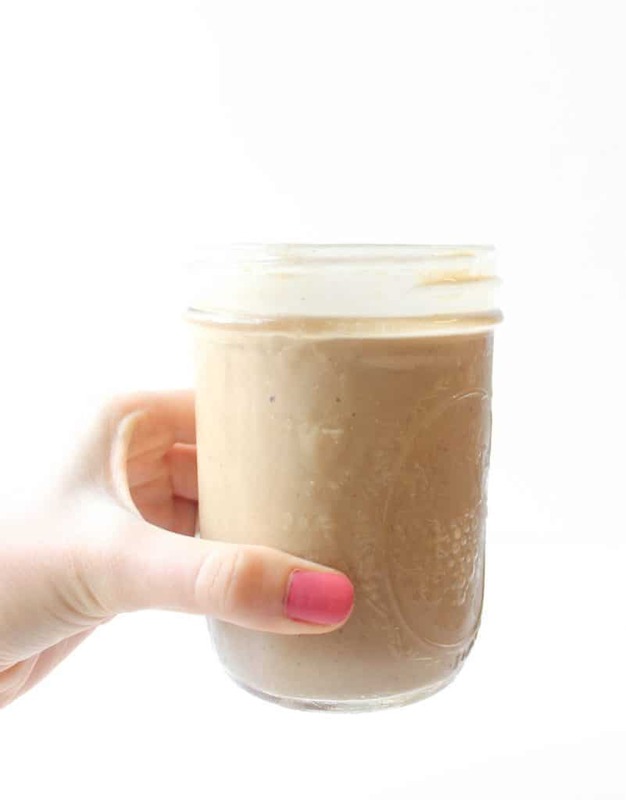 While I’m still the ice cream fanatic I’ve always been, I love having a healthy way to indulge my deepest chocolate & peanut butter cravings, too, in the form of a thick and creamy chocolate peanut butter cup protein smoothie. It’s SO good and I’m so happy whenever I take the time to make it in my dorm room. I usually drink this chocolate peanut butter smoothie first thing after I run in the morning and I feel like I’m drinking a milkshake for breakfast. Or sometimes, when I’m running low on groceries, I’ll make it for dinner. Cheers to milkshakes for breakfast and dinner! 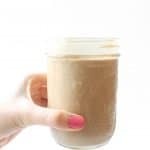 If you try out this chocolate peanut butter smoothie, feel free to let me know in a comment or take a picture and tag me @livbane on Instagram. Hope you enjoy! Add all ingredients to blender and mix on high speed until blended. Serve immediately. What were your least-favorite Halloween candies growing up? What’s your favorite way to indulge your chocolate and/or peanut butter cravings? Mmmm girl this is actually my favorite smoothie combo of ALL time! i always make mine with choc (or vanilla and add cocoa powder) protein, PB2, a few frozen bananas, and unsweetened almond/cashew milk! It really makes the creamiest smoothie that feels like a treat!! Also leasy favorite halloween candy were whoppers! always had to trade those! ha! I’m sure someone out there loves Whoppers but I don’t think I’ve ever met anyone who does! Mmm, ours sound really similar! So good! I am not much of a banana or avocado fan. Anything other suggestions for substitutes to make it creamy. Is there much banana flavor? Wish I had one now for breakfast. I use frozen spinach in about half my smoothies. You get used to drinking something that looks as though the Swamp Thing lives in it. Frozen spinach in a smoothie is good for the same reason it’s hopeless everywhere else: it’s essentially tasteless. Some other frozen items I use in smoothies that not only thicken things up but actually taste like something: blueberries, pumpkin (the canned puree, not the pumpkin pie stuff) and mixed fruit. Frozen bananas are tasty but too fattening when you’re seriously restricting calories. Chocolate peanut butter smoothies are one of my favorite breakfasts! I’ll have to be on the lookout for that brand. I actually just used up the last of my dairy-free chocolate protein powder. Hands down the best flavor combination ever! I indulged every single night with a chocolate peanut butter cup from Trader Joe’s mmmm! We will have to try this shake. Sounds so healthy. BUT peanut butter & chocolate is of course the all time favorite!! This smoothie sounds amazing girlie! I’m with you on 90% dark chocolate! And I used to feel so-so about coconut but LOVE it now! Mmm yay hope you love it! What kind of peanut butter do you use? My all natural peanut butter(Kroger brand) has 16 grams of fat. Hi Alicia! I use peanut butter powder in my smoothies since I can’t tell the difference in smoothies and that has a lot less fat and calories! Have you ever frozen PB cups?!? SO GOOD! That looks like a fabulously creamy shake and well, peanut butter and chocolate are the most delicious pairing out there. We don’t have Halloween candy over here but in general any kind of gummy candy is my least favourite. I agree on both accounts- chocolate & pb beats gummy candy for me any day! These Chocolate peanut butter cup protein smoothie is something that is best for my kids. They are just obnoxious when it comes to drinking milk. So glad your kids love this smoothie recipe, Sarah! Can you use real peanut butter instead of the powder ?